Interview with the faces of the New British Punk- BAD HABITS!! 1. Well, let's start with the big'one- Thor. You got a ton of coverage on that one, and it was incredibly funny. How did it happen? We were supposed to have a part in the film as Red was up for a minor acting role in the movie and they also suggested using this track for part of the film music. As neither of these things happened in the end we decided to spoof it up and make our own mad music video. We didnt expect all the coverage weve been getting but really appreciate the fact that ppl have been so supportive as we love to entertain on a visual level also. We are artists on all levels and we love a bit of visual grafitti. 2. 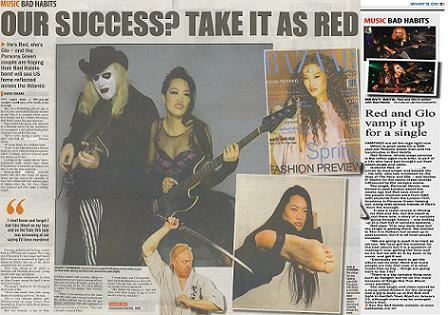 The media(such as it is) calls you guys the new face of British punk. Are you happy with that label or is it constrictive at times? Yeah we love that label or any label ppl give us. We really dont mind about labels as we know we dont sound like anyone else out there at the moment so if a label makes it easier for people to understand our sound thats fine for us. We dont try to limit ourselves within any labels ppl give us. We see ourselves as a bullet train going off the rails and whatever media wall we hit we crash into. Well take the debris on down the track and carry on going our own way. 3. I see you guys decided to do things by yourselves without bothering with an actual label- punk view or just practicality? Do you think this can be a viable solution for all bands willing to get rid of labels? A bit of both we were just tired of ppl trying to make us fit into their preconceived boxes of what they expect us to sound like and just decided to do it all ourselves. We didnt want to sound like anyone else, just original as we are. Independent labels have always been the breeding ground for new music, often when the success comes they become corporate and completely lose their identity. It is always inspiring to see new and avant garde thinkers (like yourselves, Steel and Fire, for instance) doing something new. We will always be true to our own individual vision and encourage others to do so too. 4. Black Venom is fun and very well done- any chance of taking it on the road? Or are you just intentionally planning to make us all go down to London for a Bad Habits show? 5. Tell me about Black Venom- the story, the concept and how did it all come out like this. Black Venom was an anti-super-hero-idea. A virus in the blood of Hollywood and the Establishmemt. A fingers up to the glitter machine of Pop-Idol-Ex-Lax-Factor pushers by do-it-yourself heroes. Black Venom is the dark horse and dark blood energy that runs inside everyone. Its the fuel that keeps us going no matter who or what tries to hold us down or shut it off. Its the individuality within each person that everyone should be proud of and not afraid to show. Black Venom is also the audio embodiment of pulp fiction, pop art and surrealism. The Roy Litchenstein meets Salvatore Dali dimension in this HDTV world. 6. How is the scene nowadays? Many people claim its dead in the water, but that's obviously untrue, so what's it look like from where you're standing? New horizons! We believe the face of music is changing and ppl want to hear personality shine through again as we ourselves are so bored of everything sounding too perfect, overly computerized, soulless and inhuman. Its about the energy coming through. 7. Who are you guys when the make-up comes off? That would be telling wouldnt it? 8. I see you're also doing a lot of promoter work- how did that happen? This was due to the fact we couldnt get any supports as the powers that be didnt get us, especially in Britain which has a history of the last to say yes and stab itself in the arse, and the promoters who did support us kept trying to rip us off. So we thought it was better to get rid of the middleman. We also like to promote up and coming bands who are a little bit left of centre. From September we are promoting gigs in a club in Liverpool Street (The Pipeline) where we also are filming our TV show Meet The Butanes Bad Habits/Night Breed Production. 9. What music do you guys listen to? What do you like (and hate)? We love punk, metal, hard rock, anything with punch and vigor. A good dose of melody, loads of guitars, the thunder of the drums and the scream of the wounded. We hate syrup pop and manufactured heartless crap. Love us or hate us were here to stay. Musics in our blood and we cant live any other way! Rock out! Punk on!!! And this, ladies and gentlemen, is it. You will get to hear Bad Habits on our radio soon, and until then you should head to www.badhabits.me.uk and have a look, buy their albums and support the independent scene!!! "...these guys are LOUD man!!! Riffy Dirty Punksters!!!" 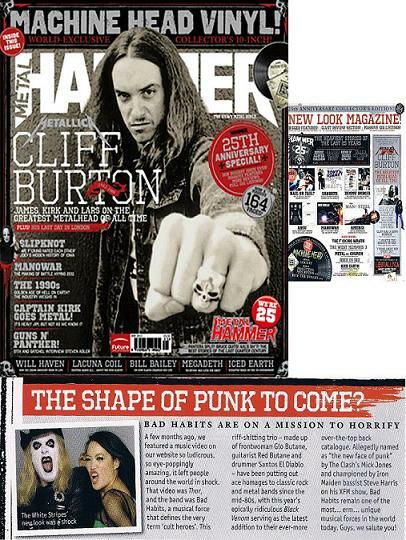 Steve Harris, Xfm Radio 104.9FM London U.K.
BAD HABITS is currently featured in a few magazines. Please check out the following links www.whatsoninlondon.co.uk and www.snazmusic.com If you find other press about our band please let us know and if you are interested in getting any material on us to do a review please contact us on info@badhabits.me.uk. Any and all support would be greatly appreciated!! !